Have Specific Questions About Using SCAIR®? Read the FAQs Below to Find Out More. Why should I use SCAIR®? SCAIR® is one of the most reliable ways for large batch manufacturers to calculate and accumulate loss estimations across their entire organisation. Furthermore, large supply chains are simply too complex to model in spreadsheets. Spreadsheets cannot provide multi-scenario analysis and are prone to induced errors, user errors and change. Spreadsheets are also not an effective way to collaborate and can’t graphically display complex supply chains. SCAIR® addresses all of these problems. My Supply Chains are complex. Can SCAIR® model everything? Yes. SCAIR® is designed to make even very large, complex supply chains visible to a wider audience through visualisation and graphical representation. Do I need to be a risk manager to use SCAIR®? No. 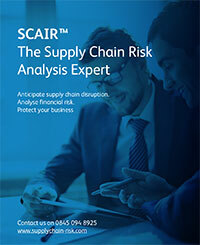 SCAIR® is designed to reduce the complexity and to increase the visibility of the risks in your supply chains. Will it help me to design my corporate insurance programme? Yes. Designing and structuring your insurance program around your risk profile ensures that the rights risks are covered to the right limit. Can I display the outputs from SCAIR® elsewhere? Yes, SCAIR® can export to other formats such as Excel as well as providing native reporting functions. Yes. One day’s training is included and we can be engaged to assist further. For example, we can also provide additional coaching in the latest supply chain risk quantification techniques. As well as manual entry, via the supply chain flowchart, we can tailor interfaces with standard business tools that already hold your supply chain data. Is SCAIR® configurable and does it support concurrent use? Yes, SCAIR® is entirely configurable. Adaptive supply maps for each product allow critical supply points to be effectively presented and communicated and you can use the terminology preferred by your organisation. SCAIR® is also designed for multiple people to use at the same time. Lock-out functionality protects your data from simultaneous change and there is no limit to the number of licensed users. How is SCAIR® set up? SCAIR® is available as a secure, fully hosted solution (Software as a Service – SaaS). The only client requirement is for Internet Explorer. There is no effort required by your IT department to set up the service. You will be provided with your own dedicated virtual server hosted in a fully accredited tier 1 data centre. Intersys provides a fully hosted service which includes technical administration, maintenance and upgrades. Most clients prefer SCAIR® to be delivered as SaaS (Software as a Service). Can it be hosted at my site (on Premise)? We can discuss hosting requirements with you. SCAIR’s security model assumes SaaS, however on premise versions of SCAIR® can be deployed on request. We take security very seriously – Intersys holds ISO 27001 certification and we take great care to ensure that the systems we use are trusted, secured and reliable. SCAIR® has been designed for multinational enterprises which demand the highest standards of IT security and confidentiality. Intersys and SCAIR® are routinely subjected to and pass rigorous IT due diligence processes. SCAIR® undergoes annual penetration testing. Can I have an SLA? Yes, we have a standard SLA and can be flexible to accommodate your needs. Can I use SSO (Single Sign On)? Yes, we can integrate with your Corporate SSO system. Yes, we have a continual development cycle to improve and develop SCAIR’s functionality and usability and to ensure it responds to the changing risk landscape. Can I use MFA / 2FA (Multifactor Authentication / Two Factor Authentication)?